The Official IRCTC Train Ticket booking online Android Mobile App is lite and good to use. Rail ticketing now made simpler just by SWIPE and SHUFFLE, SELECT and BOOK. 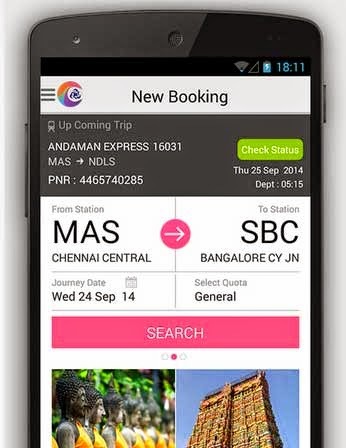 Install the newly launched IRCTC android app and book a railway ticket anywhere in India at your fingertips. Download the IRCTC Connect Android App on your Android Mobile Phone from Google Play store here. Enjoy the never before experience of online ticketing with all new IRCTC mobile app.